There are a number of companies that offer polishing pads for use on a variety of materials. Whether you use the term polishing pads or polishing discs, the end product is designed to accomplish the same thing. Namely, to process a surface or an edge of stone to give it a degree of gloss. This section of the site is made of up polishing articles dealing with polishing pads. Here is a brief description of some of the content subjects you will find in this area of the site. Stone professionals polish stone in a variety of environments. For example, fabricators polish stone in wet environments. Since wet polishing carries with it specific requirements, companies create wet polishing pads to work in this setting. So, you will find articles about wet polishing products in this section. Additionally, you can expect to find articles on topics related to the wet polishing process or environment. Dry polishing natural and engineered stone brings with it some specific needs and even challenges. Depending on the material, the methods used, and even the pads that the fabricator is using affects the results of the polish. Therefore, you can expect to find articles dealing with the dry polishing environment, tools, and techniques in this area. Stone polishing involves a number materials that need specific treatment. In fact, what you polish determines how you polished it. Additionally, the way the fabricator polishes will contribute to the level of success by how they approach the polishing. Engineered stone is a material that needs to be polished using a specific approach. Therefore, there will eventually be articles about polishing engineered stone in this articles section. Dark stones have some specific requirements for polishing. For example, how many steps does it take to polish say, Uba Tuba? The number of steps it takes to polish dark stones is only one topic that could be discussed. There are other subjects as well. For this reason polishing dark stone makes it into the summary of what kinds of polishing articles will be in this section. Granite is a very durable type of natural stone material. However, that does not mean that the fabricator uses just any old polishing pad to polish it. 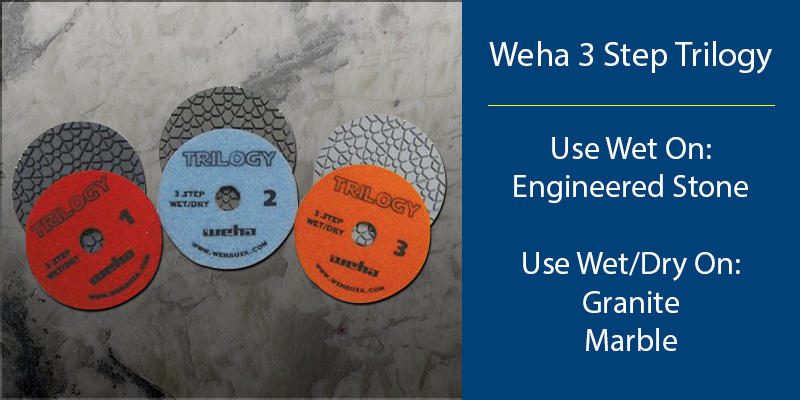 Fabricators use specific polishing pads and techniques produce various finishes. Antiquing and leather texturing are two examples of granite finishes. Fabricators use specific polishing tools to produce these finishes on granite. Marble is a natural stone that can be polished to various finishes. Accordingly, professionals keep a couple of things in mind when working with marble. First, they know what kinds of polishing pads and techniques to use. Second, they know how to polish the type of marble they are working on. Hence, marble polishing information is needed in this articles section. So in this “Pads” section of the GranitePolishingPads.net website, you should eventually be able to find information that covers polishing pads and techniques for just about all scenarios.